Registration for the Student Conference now open! Happy New Year from the JASAL committee! The Student Involvement in Self Access Centres Conference is now coming up very soon (1st & 2nd Feb) (more details here). We have around 10 different student presentations for participants to enjoy, and hope that many JASAL members can come to learn from and support students working hard in Self Access Centres around Japan. and sending it to studentconference2013ATgmail.com ASAP. We will also accept onsite registration, but it would help our planning greatly if you could indicate your interest for the different events we will be holding in advance. Registration is free for all students, but, as we are a non-profit conference with very limited funding, we ask for a suggested donation of ¥2000 from professionals attending the conference, to help us cover transportation, food and accommodation costs for student participants who otherwise would not be able to attend. If you would like to use the onsite accommodation at Nanzan Kenshu Centre, please make sure you return the form by 24th January (sorry about the short notice). Please understand that, due to a limited supply, we cannot promise to be able to meet all requests. Hope to see many of you in Nagoya in a few weeks! Season’s Greetings from JASAL! I’m sure there have been many parties held in Centres over the last few weeks, and that we’re all looking forward to a well-earned break. The nights are drawing in, which means that it’s almost time for Father Christmas to visit, and more importantly, that the Student Involvement in SACs Conference is getting closer. We are happy to announce that there will events over 3 days (1st -3rd Feb), with the main event, the student presentations, taking place on Sat 2nd Feb. See the conference page for more details. The deadline for proposals from students (max. 200 words) is January 10th. Please have your students email their proposals to studentconference2013@gmail.com, where they will be read and selected by the conference committee, made up of Sugiyama Jogakuen University students. If you are intending to bring/send students to either attend or present at this conference, but have not yet submitted a proposal or confirmed your interest, please contact the conference organisers at the email address above, especially if you would like to use the accommodation provided at the Centre, as it is quite limited. If the demand is high, it may be necessary to find alternative accommodation. Gook luck with all your SAC related endeavours in 2013 – JASAL will be here to support you! 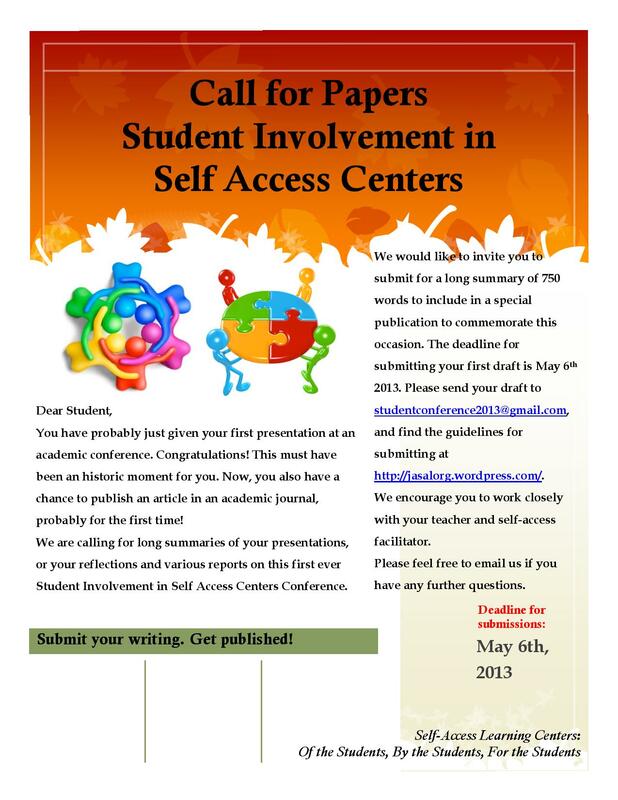 More information has now been added about the Student Involvement in Self Access Centers Conference. Please download this Conference details document and share it with interested students. We will add more information as it becomes available so please check the conference page (linked to above) regularly.